March 2019. The Pope Video: Today, our modern society, which is so advanced, continues to persecute people because of their faith. There are people who die and who are persecuted for following Jesus Christ, not to mention the discrimination against Christians in so many countries where they are not acknowledged, or where their existence is subtly rejected through insults and unjust demands. Let us defend their rights! “It might be hard for us to believe, but there are more martyrs today than in the first centuries. They are persecuted because they speak the truth and proclaim Jesus Christ to this society. This happens particularly where religious freedom is not yet guaranteed. However, it also happens in countries where, in theory and on paper, they protect freedom and human rights. Let us pray that Christian communities, especially those who are persecuted, feel that they are close to Christ and have their rights respected.” Each month, The Pope Video disseminates the Holy Father´s prayer intentions regarding the challenges of humanity and the mission of the Church. Young people who move, who throw themselves into the adventure of faith, who follow Mary´s example. Thousands, tens of thousands, even millions of them are gathering this month of January in Panama for the 2019 World Youth Day. Let us share with them the joy of the Gospel. "You young people have, in the Virgin Mary, a reason for joy and a source of inspiration. Take advantage of the World Youth Day in Panama to contemplate Christ together with Mary. Let us pray the Rosary together for peace, each of us in our own language. And ask for strength to dream and to work for peace. Let us pray that young people, especially in Latin America, follow the example of Mary and respond to the call of the Lord to communicate the joy of the Gospel to the world." Let us not allow ourselves to be robbed of missionary enthusiasm and let us pray that consecrated religious men and women may bestir themselves, and be present among the poor, the marginalized, and those who have no voice. Religious, with their prayer, poverty, and patience, are essential to the Church’s mission. More than ever, with the challenges of today’s world, we need their complete dedication to proclaiming the Gospel. If young people don’t have the possibility of education, what future can they have? The pope video: Together, let us ask Jesus that any far-reaching decisions of economists and politicians may protect the family as one of the treasures of humanity. The pope video: That priests, who experience fatigue and loneliness in their pastoral work, may find help and comfort in their intimacy with the Lord and in their friendship with their brother priests. The tiredness of priests... Do you know how often I think about it? Working on so many active fronts, they cannot remain inactive after a disappointment. At such times, it's good for them to remember that the people love their priests, need them, and trust in them. Let us pray together that priests, who experience fatigue and loneliness in their pastoral work, may find help and comfort in their intimacy with the Lord and in their friendship with their brother priests. Video Pope Francis - June 2018: That social networks may work towards that inclusiveness which respects others for their differences. Video Pope Francis - May 2018: That the lay faithful may fulfil their specific mission, by responding with creativity to the challenges that face the world today. Video Pope Francis - April 2018: That economists may have the courage to reject any economy of exclusion and know how to open new paths. 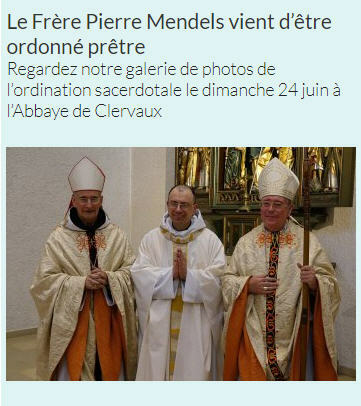 L’Abbé de Clervaux, le Très Révérend Père Dom Michel Jorrot, et la Communauté des moines vous invitent à assister à une ordination presbytérale le dimanche 24 juin 2018 à 15 heures en l’église abbatiale. 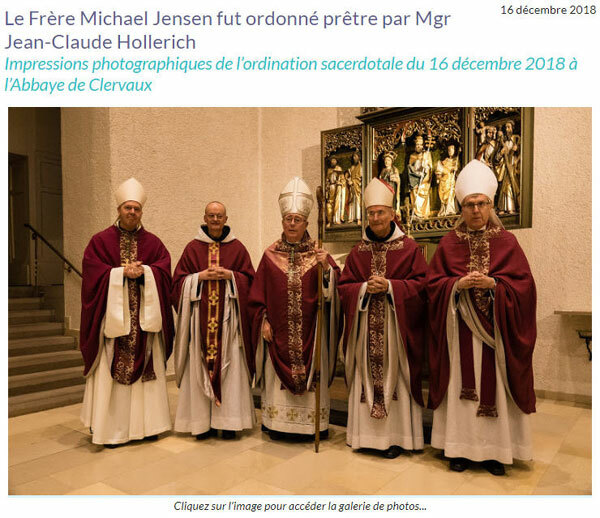 Le Frère Pierre Mendels, moine de Clervaux, sera ordonné prêtre par Mgr Jean-Claude Hollerich SJ, Archevêque de Luxembourg, au cours de la messe concélébrée. Le Frère Pierre Mendels est né à Ettelbruck le 27 janvier 1965. Il a poursuivi ses études secondaires au Lycée de Diekirch avant d’entrer à l’Abbaye Saint-Maurice en 1985, où il a émis sa première Profession monastique en 1988. Ensuite, il a fait sa formation théologique à l'Abbaye. 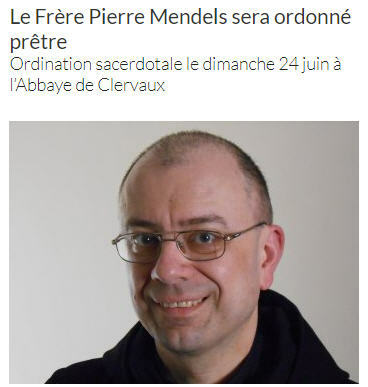 Le Frère Mendels a été ordonné diacre en 2004. Les vêpres solennelles seront exceptionnellement ce dimanche 24 juin à 18.15 heures.